The Kansas City area's only exclusively avian veterinary hospital, providing medicine, surgery, trimming, boarding, and house calls. We carry Zupreem, Kaytee, Roudybush, and Harrison's diets. See the Rescue Room with dozens of birds for adoption! Do you need to know how to take care of a bird for just a few days, or have a question about proper temperature, housing, or food? Click this link to go to our page with basic care instructions for a variety of birds from finches to macaws to ducks to chickens to pigeons to turkeys! Burge Bird Rescue: view birds for adoption! Our Practice: Services, hours, and location. Frequently Asked Questions: What bird lovers want to know. Emergencies: How to handle them. Our Staff: Who takes care of your birds? Websites and Veterinary pages that we recommend. Web rings: on related topics. Email Us: Do you have a question? Support our rescue birds by using GoodSearch for your internet searches, and GoodShop when you are buying online. 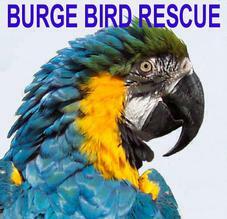 Just click the links below and enter Burge Bird Rescue as the organization that you support.